Journeys of heart and mind: Up, up and away! Yesterday was a very special day. Elon Musk's company, SPACEX, launched a small rocket and carried a dummy payload into Earth orbit. So why is that special? Here's why - it's a major change from government funded space programmes to private spaceflight. SPACEX is a privately owned company, and they achieved this all by themselves. To everyone at SPACEX and Elon in particular. Well done everybody, this is a great day for spaceflight and space exploration. In fact it's a major turning point that will go down in history. On Sunday 28th September 2008 private individuals running a private business have a space programme! From this day forward, spaceflight is no longer the domain of governments and big business alone. Cheaper orbital access is coming with the Falcon family and in a few years with Dragon - first for cargo, then for astronauts. This is fundamentally different from major aerospace companies launching communications and weather satellites. Why? Because they are in it to use expensive technology developed by or for government programmes. The days of cutting edge at high price are coming to an end, to be replaced by routine at budget prices. SPACEX - you have changed the world... er, I mean space! The company - Elon Musk had already run several highly successful startup ventures including PayPal. He has spent some of the proceeds on innovative technology startups like Tesla Motors and Space Exploration Technologies (SpaceX). SpaceX has designed and built Falcon 1 from scratch, it is intended to be cheap to operate, mainly reusable (the first stage is designed for recovery, the second stage is expendable), and simple. Simplicity is really the key, a simple design is likely to be both cheaper and more reliable than a complex design. The successful flight - After three launch failures, the fourth attempt resulted in a smooth ride to orbit. 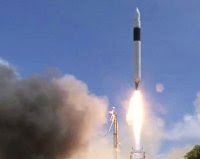 Falcon 1 has shown it can do the job and the next flight in early 2009 is expected to loft a Malaysian satellite. This will begin a revenue stream for SpaceX and put the company on track for eventual growth. Meanwhile, 2009 should also see the first flight of Falcon 9, a much larger and more powerful launcher. Meanwhile, although the first success placed only a dummy payload into orbit, it did so accurately and without incident. The icing on the cake was that the second stage engine was successfully restarted while in orbit, something SpaceX hoped to achieve, but not necessarily on such an early flight. The future - Falcon 1, Falcon 9, and perhaps Falcon 9 Heavy will meet the same requirements as other launchers already in the market place, but they'll do it at perhaps a third of the price. This suggests that SpaceX may be a name to watch, they might be able to clean up, taking over a large part of the space launch business. Not only that, the company is building a cargo delivery craft, Dragon, which will launch on Falcon 9 and is also expected to fly in 2009. And a passenger version is already under development and may fly in 2010, carrying up to seven astronauts to the International Space Station (ISS). As if even that is not enough, the launch manifest for 2011 has a Falcon 9 booked for Bigelow Aerospace who plan to orbit their third inflatable habitat, Sundancer. It will be the first privately developed and launched craft capable of use as a manned space outpost. Bigelow already have two development systems in orbit, Genesis I and Genesis II, both are still in operation and returning images and other data at the time of writing. In other words, SpaceX and Bigelow taken together represent the beginnings of private, manned, orbital spaceflight. Now that really is exciting!